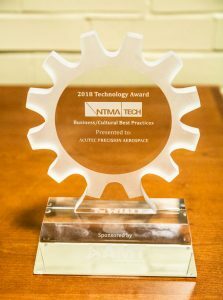 Acutec Precision Aerospace Wins 2018 AMT Technology Award | Acutec Precision Aerospace, Inc. The L10 meeting was developed with CultureShoc, a workplace culture development firm based in Westwood, Ohio. Team members identify, discuss and solve issues, and each meeting is rated from 1 through 10 at the end. Acutec also has an intranet portal that allows for company-wide communication. All personnel have a computer terminal on which they have the Acutec.Web intranet portal. That portal has an announcement box that has company-wide communication such as visitors, customer feedback, community engagement events, company committee meeting minutes, process changes, quality alerts and monthly letters from the president which allows for commenting. “Acutec has a comprehensive communication plan that emphasizes intra-team problem-solving,” said Chris Smith, Co-Founder of Lojic LLC. Smith previously served as the IT Administrator of Acutec before co-founding Lojic LLC. with Acutec President CEO and President Elisabeth Smith (no relation) and Lead Software Developer Brett Zook.